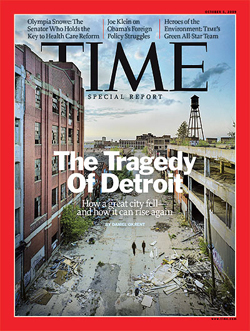 The October 5, 2009 issue of Time magazine has a 10-page Special Report on Detroit, titled “Notown.” But it’s the same old story–blaming the workers for wanting to better their lives and specifically African Americans for demanding that the city take up their needs–along with self-serving politicians and the Big Three for tunnel vision. The article would lead us to believe that overpaid auto workers and Coleman Young caused the lack of a manufacturing policy that prioritizes meeting the needs of the population. The reality is that auto workers’ benefits and wages represent less than 10% of the Big Three’s expenses. The real news is that Detroit is still the quintessential American city–first built by manufacturers who proceeded to pollute the city with its poisons, to destroy the transit infrastructure that existed at the beginning of the 20th century, and then to lobby for the highway construction that led the better-off working class to move to nearby suburbs, where newer homes and better schools were subsidized through various governmental programs. Yes, Detroit is 40% vacant, and much of the land is polluted. Our schools are a shambles, now being privatized as the “solution” to a 30% graduation rate. There are no national grocery chains left in the city and one-third of the population doesn’t own a vehicle. It is the most segregated city in the country: the population is 85% African American. Poverty, a lack of services, and a nearly 30% unemployment rate have devastated the city. Some of the nearby suburbs are now beginning to face the same problems, as business leap frogs to other areas and unemployment increases. But no politician deviates from the script: we have to give special breaks in order to bring (or keep) business in Michigan. We need a retooled manufacturing industry, the clean up of the poisoned land, construction of mass transit and an infrastructure that can support our residents. This includes support to the urban farms that have sprung up throughout the city in order to provide nutritious food and to the creative poets, musicians, performers, artists and writers who are the source of transforming our schools and our community.